I made these paintings a little while ago but never got around to posting them here. 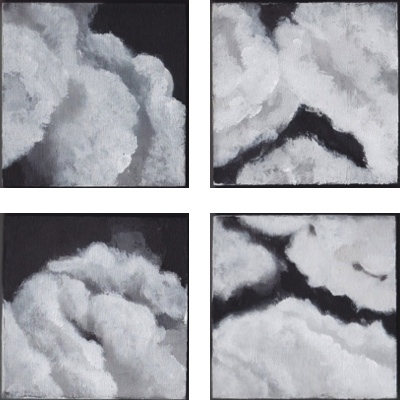 Cumulonimbus is the second series of my 4x4for44 project. Each are painted on a 4 x 4 inch wood panels using acrylic. I brought them with me to the Toronto Indie Art Market to see how people would react to them. It's always interesting to hear other people's interpretation of a piece. I was lucky to have a visitor comment on them and she saw them as being a nice inspirational reminder where you could decide in the morning if you're day's going to be a good day, focusing on the beauty of the cloud or a bad day, focusing on the fact that dark clouds could bring rain. It's all in the way you look at things.